Thank you so much, Molly, for passing along this award. 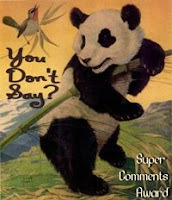 This cute panda "acknowledges those who frequently comment on the others' blogs." It's nice to get awarded for being a motor mouth (continuous commenter?) for a change! If you haven't been to My Cozy Book Nook, I urge you to click through and check out Molly's great blog. I finally got my tabs up and running. I've taken the slideshow of my awards off the footer. I think it might have caused my blog to load a bit slowly. All my awards are now on their own page, which can be found by clicking the tab. I've organized all my reviews by author, title, and genre. Alphabetical lists with links to the reviews can be found by clicking on the tabs. Although I've done only two interviews so far, they too are listed on their own page and are given a tab. Over the weekend I hope to finish the final edits on my review policy and get that linked up to its tab. The other task I hope to complete this weekend is cleaning up my labels. Jackie at Farm Lane Books was asking for ideas of how to use tags and categories in Wordpresss. I commented there that I thought I had a good system for my labels (Blogger). Ha!! I spoke too soon, and now I'm a bit embarrassed. When I really looked at my labels, I saw that there were typos and duplicates and that some labels were fairly useless. So Jackie is my inspiration for this big job. Again, you continue to set the standard for coolness and blog improvement! I love the changes you have made. No idea how you do these things, but I like them! So when you start tidying up your tags, do you go back and change the ones in your archives, or change them going forward? Sandy: I am going back to the beginning and changing the labels on every post. Big job, but I feel if I don't do it soon, it will never be done. You've been busy! All of your changes are great. Congratulations on your award. I SO want to add tabs to my blogspot page. I spent about 6 hours one weekend trying to do so, and finally just gave up. You have inspired me to try again. Wonderful changes. I would love to add this feature, guess I should get to work! Great job beth. I spent a few afternoons updating all my posts because I had forgotten to put labels on all of them and actually had some I hadn't titled. I would go to look for a post and couldn't find it. Now I can look up by categories. It does take time, but is well worth it. Congrats on the award! Your changes are great! I would love to hear how to create tabs in Blogger. I've seen it done and would love to add that to my blog. You are inspiring me! How tidy and organized you are. I could invent a lot of excuses why I am not - right now - but it is probably stupid, because before or later you guys will just realize I am not tide - because I am not. Everything looks fantastic! Is this a blog version of spring cleaning?? Wish I was that motivated! Awesome Beth! I'd love to get some tabs going on my blog too. Just to find the time lately. lol. Have a great weekend! I simply adore your tabs!!! How cool and organized. I want that too ;o) How did you make them? You don't have to type a step-by-step thing, maybe you can direct me to a webpage with an explanation...? It looks great and very organized. Congrats on the award Beth! Your tabs look great! I want them too! Not to be a copycat (as I have the same template) but would you share how you did this? As Louise asked above, a webpage link would work for me. I'll put the link up in tomorrow's link-up post. I hope I can find all the sites I used. I first did these on my test blog -- it took several tries to get the tabs looking right. Great job with the tabs. You've been busy. Congrats on the award, too - it's very well deserved. I always look forward to your comments. I have a new template to put up but am not feeling quite as industrious as you right now ...! I really need to do some maintenance work on my blog as well! Congratulations on the well-deserved award. Love the changes! I need to fix my labels too...but it's such a huge task I'm afraid to even start. Tabs are looking great! And you've inspired me to tackle my labels again. You are just so handy with all this stuff! Your tabs look great! Spring cleaning really paid off for you. Congrats! I love your changes - I'm really proud to have been an inspiration to you! I've been a bit busy recently so haven't had the time to sit down and reorganise my tags, but hopefully I'll work out a new system soon. Jackie: you inspired me to clean up my labels and finally add my tabs. So you get double credit. Took most of the day to do the labels and most of the next day to finalize my review policy. I love the ease of navigation with tabs - I have reviews (children's on a separate page) by title ... will think about adding tab listing by author as well. My categories/labels need to be cleaned up as well! You'll inspire me to start brainstorming a finite (for now) list of categories to choose from, then go back and clean up. Congrats on the award, Beth! I love your navigation tabs!